Pain management in the elderly is a complex undertaking for physicians, as so many variables should be taken into account. Essentially, they must establish whether the type of pain is due to an acute episode, or is a chronic feature. Acute pain is commonly caused by incidents such as sudden injury. Many surgical procedures can contribute to the experience of acute pain, and in the case of surgery, plan pain management in the elderly in advance of the procedure. Acute pain is often sporadic. Control of this type of pain is not always consistent, and in such cases, attention should be paid to ensure the elderly patient is receiving regular, carefully dosed analgesia. Do not assume that an elderly person will remember to take medication at regular intervals, and it is equally important to acknowledge that correct dosages are monitored. Compliance is often poor in the elderly. 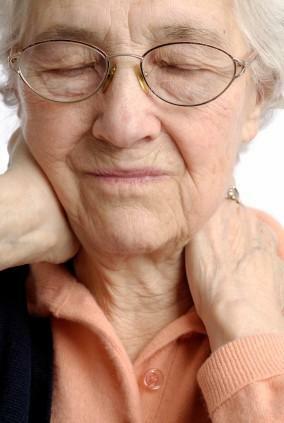 Chronic pain classically worsens over a period of time, and can last for many years. Pain management in the elderly is usually easier in the treatment of patients with chronic pain, as this type of treatment usually requires administration by a medically-trained person.For example, cancer sufferers, particularly in the advanced stages of the illness, usually require regular doses of opiate drugs such as morphine. To adequately manage pain, these drugs are usually given by injection or intravenous infusion. Pain relief of this magnitude must be administered by a registered nurse or physician. Patients in receipt of drugs such as morphine are at risk of potential side effects, such as respiratory depression. Additionally, the use of morphine is commonly accompanied by nausea, therefore correct dosage is critical. Still, the advantages of receiving such a drug far outweigh the disadvantages. For those coping with chronic pain, attendance at a pain management clinic is often desirable. These clinics are lead by a team of physicians and nurses who specialize in anaesthetic drugs. The specialist team will provide a detailed assessment of pain, and deal with the types of drugs that general practitioners are not commonly used to prescribing; therefore, it is left to the experts. An older person, free of pain due to effective pain management, can remain mobile and independent, and this allows them to maintain their regular activities of daily living. At times, it is necessary to try various forms of pain relief before adequate pain control is achieved. Often due a lack of understanding, or ability to communicate effectively, the patient may hinder the process of getting the level of pain management just right. Apart from the more dangerous side effects of opiate-based pain relieving drugs, patients can also experience side effects of long-term use. Drugs such as codeine might cause chronic constipation, dizziness and nausea, and it is a drug renowned for dependency problems in long-term use. It is essential to document and monitor closely painful and potentially dangerous side effects in long and short term use. Effective pain control is only achieved with a patient's 100 percent compliance. Due to the additional problems of confusion and forgetfulness, the responsibility of taking regular medication is often a burden with which older and ill patients struggle.When a physician prescribes any form of pain relieving drug for an elderly person, it is part of their professional responsibility to ensure that regular monitoring is carried out, and that the patient is capable of compliance. Patients should have medication reviews on a regular basis, particularly when high dose or dependant drugs are being taken. Alternative therapies are becoming a popular approach when dealing with pain management in the elderly. The effectiveness of alternative therapies however, is yet to be scientifically proven. With wider access to therapies such as acupuncture, reflexology and aromatherapy, even general practitioners recommend these alternative approaches to managing pain. It is believed that the psychological benefits of receiving such therapies can have a positive effect on the perception of pain. In chronic conditions such as arthritis, short courses of alternative therapies can be of benefit, particularly when the condition is in an acute or inflammatory phase. Alternative therapies are not widely recommended for continued or long-term use. Follow careful consideration when deciding on a pain management plan, as some elderly individuals are vulnerable, and their bodies do not cope well with some forms of pain- relieving drugs. Patients should be allowed the freedom of choice when it comes to receiving pain relief. A person who suffers frequent and unpleasant side effects of a drug may prefer to try alternative therapies in an attempt to avoid this. Most importantly, they must be able to afford the therapies if they choose the alternative route. It can become a costly exercise particularly in the "trial" stage.